Ollie: Do you have to ask your wife everything? Stan: Well, if I didn't ask her, I wouldn't know what she wanted me to do. Few comedy teams have remained high in the popularity of both critics and the public as have Laurel and Hardy over the last seventy-plus years. Although their silent output is almost entirely available on DVD, until now Region 1 was bereft of the classic sound films of the team. This omission is finally begun to be made right with the new disc from Artisan in cooperation with Hallmark Entertainment, which features some of the boys' best work. Sons of the Desert (1934) is generally considered to be one of the team's best feature films. Their chapter of a fraternal organization, The Sons of the Desert, is set to attend its annual convention in Chicago. Having taken an oath to attend, Stan and Ollie have to figure out how to get their wives (Mae Busch and Dorothy Christie) to consent. Ollie's wife Lottie (Busch) refuses, so he hits on the idea of faking illness and getting a doctor to send him on a sea voyage for his health. Since Lottie gets seasick, she sends Stan to accompany Ollie. The plan works well enough to get the pair to Chicago, but things begin to go awry when the ship they were supposedly on sinks in a typhoon. Heavily dependent on verbal comedy rather than the more knockabout technique of their short films, Sons of the Desert contains endless moments of hilarity. The genius of Laurel is demonstrated by his managing to make the lame old gag of eating wax fruit to be laugh-inducing just through his facial expressions. This seven-reel comedy demonstrates the pair at their best in the realm of feature films, without the usual obligatory romantic interests and musical numbers that just get in the way of the Laurel and Hardy magic. Just that film would make for a "must-purchase" DVD, but the wealth of comedy is just beginning. In 1932 Laurel and Hardy won the Oscar® for Best Short Subject for the three-reel comedy, The Music Box. Although essentially built on a single gag, they manage to make that single gag endlessly funny over the course of nearly half an hour with endless creative variations on the theme. The Laurel and Hardy Transfer Company ("foundered 1931") has a simple task: deliver and install a player piano. The rub is that the house to which it is to be delivered is at the top of a seemingly endless flight of stairs. Despite their best efforts, the piano continues to hurtle to the bottom time after time. The last reel is devoted to installation of the piano in the house, and then the mayhem begins in earnest. The picture is full of great moments (such as Ollie's fury when he catches Stan riding on the box instead of pushing it), and throughout the jangling chords of the piano emphasize the fragility of their task. There's not a spare moment here and the picture is perfectly edited, with the result being of one of the greatest comedy films of all time. The earliest film on the disc, Another Fine Mess (1930) finds the boys on the run from the police. They duck into the mansion of Col. Wilberforce Buckshot (James Finlayson), a wealthy big game hunter who coincidentally has made plans to rent his house out while he's in Africa. When prospective tenants show up, Hardy assumes Buckshot's identity and Stan plays both the butler Hives and the maid Agnes. But Buckshot returns unexpectedly, and everything falls apart, culminating in a bizarre sequence of a mountain goat riding a bicycle. This early sound film features the oddity of having the credits spoken onscreen by a pair of usherettes. The best bits involve Hardy trying to show the tenants the rooms of a house with which he's completely unfamiliar. Finlayson has some mannered double takes that modern viewers will find irritating; they tend to point up just how naturalistic Stan and Ollie's style was, lending it a timeless quality. Busy Bodies (1933) is the most slapstick film on the disc, as the team goes to work at a large woodworking shop. The prevalence of power and hand tools in such a place results in predictable violence and physical comedy that would be right at home in The Three Stooges series that would begin the next year, right down to an eye poke. Wrapping up the package is County Hospital (1932), which is one of the weakest films here. Stan visits Ollie in the hospital and soon the doctor is dangling from an upper-story window and all manner of mayhem is breaking loose. Ollie is immediately thrown out and Stan drives him home under the influence of a powerful sedative. This last sequence is fairly lame and suffers from horrific rear projection that's completely out of scale and not credible in the least. 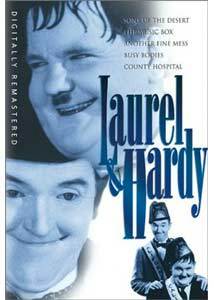 But B-list Laurel and Hardy is still funnier than the A-list comedy of many other comics and it's still worth watching. Image Transfer Review: The original full frame is presented here, and not the widescreen butchering that sometimes afflicts these pictures when aggregated into anthologies. Most of the films tend to appear rather dupey and soft. This may be the result of too much digital video noise reduction. However, speckling and frame damage is generally minimal, so there's a bit of a tradeoff going here. Most of the films tend to be a bit too contrasty, with little shadow detail. By comparison, the British Region 2 disc of The Music Box and Busy Bodies has more detail and texture present, but more speckling; it also has more shadow detail but very weak black levels. On the whole, the R2 material looks a bit more film-like, but an argument can certainly be made in favor of the cleaner presentation of the R1 disc. Audio Transfer Review: Artisan thoughtfully provides two different 2.0 English mono tracks (though one of them is misdescribed as being 1.0). The default option is for a cleaned up version that substantially reduces hiss and noise at a cost of some of the presence of the audio (never terrific to begin with). The other track is the original, unrestored and slightly less muffled-sounding audio track. Switching back and forth between the two is interesting, but on the whole the restored track will probably be preferable for most people. Extras Review: A few mildly interesting extras accompany the films. A 10m:03 featurette ostensibly about producer Hal Roach, The King of Laughter, spends most of its time talking about Laurel and Hardy and only briefly touches on Roach without giving much actual information. Mel Brooks, Dom DeLuise, Steve Allen and John Hughes expound on the team's excellent timing. A then-and-now location tour provides vintage photos of the Roach studios and location shots (including the Music Boxsteps) and what they look like today. A 3m:51s photo montage includes stills from the films and a Hal Roach gallery. A text article from a 1987 magazine profiles the then-95-year-old Roach (he died in 1992 at age 100). Finally, a list of contact information for selected tents in the real Sons of the Desert organization (a Laurel and Hardy appreciation club) are provided. Text bios for the stars and Roach complete the package. One big negative: the menu music is at practically deafening levels that will have many viewers diving for the remote control. Why is it so much louder than the audio for the featured films? Two and a half hours of some of the greatest comedy films ever are presented in a packed disc. While the transfers aren't exactly sparkling, they're more or less serviceable.